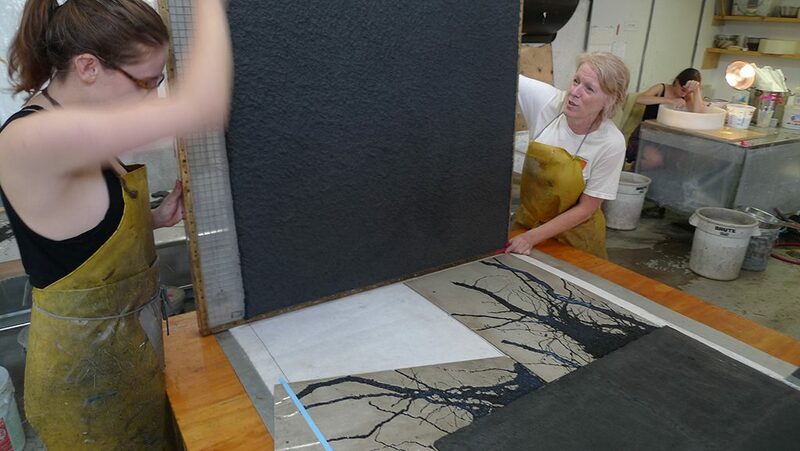 Katherine DeLamater, left, assists Ruth Lingen in couching a pigmented black sheet of paper onto Leonardo Drew plates filled with ‘magnum’ bits. Ruth Lingen introduced the audience to her decade-long work at Pace Paper—a satellite of Pace Editions and Pace Gallery in Brooklyn, New York—by showing examples of her collaborations with artists. To the amazement of the audience Lingen explained some of the paper and print requirements that constantly push the boundaries of artistic matrices. Shepard Fairey (perhaps best known for his Hope poster created for Barack Obama’s presidential campaign), the pop-artist Donald Baechler, painted pulp monoprints by Daniel Heidkamp, Leonardo Drew (sculptural prints on an enormous scale), Li Songsong’s dimensional work were discussed and explained during this lively plenary session. 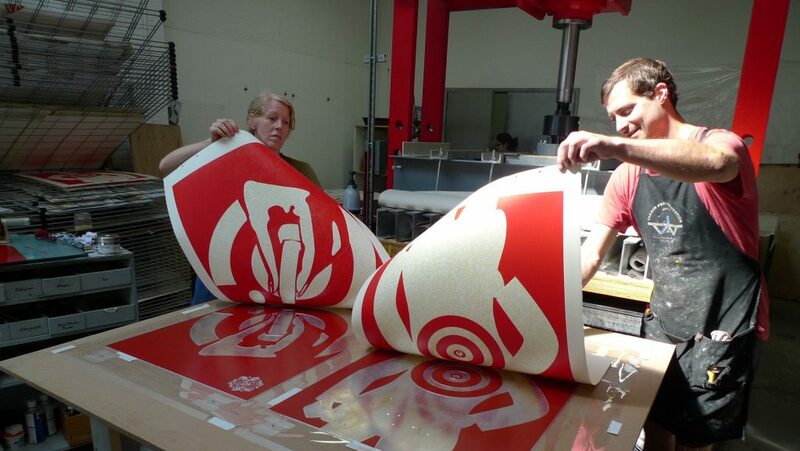 Justin Israels, right, assists Ruth Lingen in printing Shepard Fairey editions. The red shown here is the first of three colors to be printed on custom made handmade paper. Ruth provided photos and video that showed the complexity of the paper- and printmaking requirements for these artists. Baechler, for example, needed pigmented pulps as a base for his woodcuts which were attached to a larger sheet with chine colle; whereas Shepard Fairey required fluffy pulp for his chromatic prints. Lingen can make up to 50-60 sheets per day, with one other person and interns or assistants as needed. 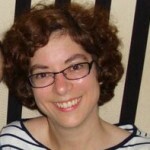 She has set up a system, which requires careful pre-planning, allowing her to work fast and with a timer. Other techniques she has developed for her custom paper are spraying and dusting, pulp stencils, dimensional molds, and using cake-frosting tips for precise application of colored pulps (for a Chuck Close portrait). In certain instances, the artwork is created only through the colors and techniques of the paper pulp; but other artists use her custom papers as a matrix for their prints. Reflecting on her work and experience with artists, she sees that artists are interested in pushing the boundaries with scale and size (they always want to go big which keeps her work challenging and engaging); they are interested in variable editions (a practice that allows unique results within the same projects); and they want to explore texture and tactileness—all of which Ruth has developed in the studio. She concluded that because she has been able to successfully develop methods to create very large sheets and figure out ways to print on them, her work is a physical demonstration that others can also do it, which bodes very well for the world of handmade paper and printmaking.